The United States Department of Justice has recently recognized a pattern of injustice among Black male teenagers in the Southern Region of the United States (Georgia and Florida). As you know, the United States Department of Justice first allows each matter to be handled on the local/state level before they step in. Prior to my son’s trial, I’d established a file with the U.S. Department of Justice because of the misconduct of my son’s private paid Defense Attorney Gregory Cummings and Circuit Judge James C. Hankinson was clear and precise. State Prosecutor Jack Campbell’s bias actions were inevitable—considering his dad, Leon County Sheriff Larry Campbell, has jurisdiction over the investigation. By all accounts—my son was wrongfully charged. And I knew that it was going to take a stockpile of LIES from those in authority to get State Prosecutor Jack Campbell the guilty verdicts that he so desperately needed. And that is exactly what some of those in authority on the local level delivered. The Florida Department of Law Enforcement agents were truthful to their laboratory reports and their testimonies. On the other hand, the medical examiner and some of Leon County Sheriff Larry Campbell’s deputies committed Perjury—they delivered that stockpile of LIES. Governor Scott, this is my fourth letter to you—previously I’d asked you to assign a Special Prosecutor to my son, DeShon Thomas’ case because I knew that State Prosecutor Jack Campbell was going to play every card in his hand—recruit every Leon County Sheriff Deputy at his disposal and use every loyal resource possible in order to get guilty verdicts in my son’s cases. With the Campbell’s family history of involvement with local enforcement agencies—specifically the Leon County Sheriff’s Office for nearly/ over fifty years—those are sure resources. 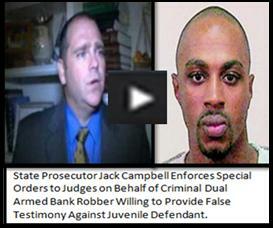 I knew that State Prosecutor Jack Campbell would not ethically represent the State of Florida in the double murder case where his dad—Sheriff Larry Campbell has jurisdiction. I wasn’t able to persuade you to assign a Special Prosecutor to my son’s case. Neither was I able to come across a local Tallahassee attorney willing to get involved in a case that smelled so foul. Note: My family and I are originally from Orlando, so we were unfamiliar with Tallahassee’s family run business within the Leon County Judicial System. As you may or may not remember—in January 2011, my 17-year-old son, DeShon Thomas was a student at Tallahassee Community College and worked at Taco Bell. After DeShon’s 20-year-old ex-girlfriend and her 17-year-old brother were found murdered in their townhouse in Tallahassee. The female victim was pregnant—there was a question as to who fathered her unborn baby. She’d entered back into a relationship with a man who thought he was the father of the unborn baby. Also, the female victim was the mother of a toddler daughter. The daughter was left unharmed in the townhome. The male victim in the case was diagnosed as being bipolar and was no stranger to violent criminal behavior. At the height of the murder investigation Leon County Sheriff’s deputies focused all of their resources on DeShon. DeShon was charged as an adult for Cultivation of Marijuana and Possession of Drug Paraphernalia. This charge came after sheriff deputies located 5 pots of soil with marijuana stems sprouting from them in the bedroom closet of DeShon’s co-worker/ roommate 21-year-old Trentin Ross. After Leon County Sheriff Deputies violated a number of my son’s Civil Rights—including denying him an attorney—on February 7, 2011 DeShon was charged with Two Counts of 1st Degree Murder. A month later—DeShon was charged with Possession of a Firearm by a Juvenile Delinquent—in which the firearm was not in his possession—was not at his residence and was not the murder weapon. Over a year later, as DeShon sat in the Leon County Jail awaiting trial—simultaneous to firing his private attorney—he (my son) was charged with Solicitation to Commit 1st Degree Murder with the target being Trentin Ross. Supposedly, Mr. Ross statements were the only reason for my son being in jail. However—for over a year—Mr. Ross had not given a sworn deposition. So in actuality—my son had no proof that Mr. Ross had given incriminating statements against him. The Reserve Deputy (Don Odham) who claimed Mr. Ross had given him incriminating statements about my son—was no longer with the Leon County Sheriff’s Office—possibly for criminal activity that he was a party to in the State of Alabama. DeShon had about 5 attorneys on his case—four of them were court appointed. My son’s last court appointed attorney was the second to be appointed from the Office of Criminal Conflict and Civil Regional Counsel. When Regional Counsel Daren Shippy came onboard (March 2013) he immediately filed a Motion to Withdraw— that motion was denied by Circuit Judge James C. Hankinson. I looked closer into my son’s file at the Leon County Clerk of Courts, I learned that Circuit Judge James C. Hankinson severely violated my son’s U.S. Constitutional Rights (in which I informed you about in my 3rd letter dated May 5, 2013). In June 2013, Judge Hankinson was replaced by Circuit Judge Jackie Fulford. My son truly hoped to get a fair and just trial. He is innocent and he was eager to prove it. Unfortunately, that did not happen. Just this past October—my two sons and I sat through days of watching men dressed in Leon County Sheriff uniforms, men in suits and men with PhD’s and other degrees commit Perjury with a straight look on their faces. What an experience! Note: At the time of DeShon’s arrest—he was on the path of Paralegal studies at TCC. My older son (Bobby) was in his senior semester at Florida State University majoring in Criminal Justice and a minor in Communications. There is no amount of public education and/or training that could’ve prepared my boys—my young sons—for this Evil—so up close. Fortunately, my sons already had an established relationship with God. From a mother’s perspective (grant it a more mature adult) it was clear that State Prosecutor Jack Campbell could not have accomplished his goal of getting guilty verdicts with his witnesses telling the truth. And where there were very little Objections by Regional Counsel Daren Shippy—well I’ve since learned that that will be helpful in an Appeal—it will help show ineffective counsel. In November 2013, I sent an email to Attorney General Pam Bondi regarding Circuit Judge Fulford allowing several Perjured testimonies to go to the jury. In part, Attorney General Pam Bondi advised that I get a lawyer. Of course that’s easy for her to say—but the thing is—I hired a private lawyer for my son. I paid Criminal Defense Attorney Gregory Cummings $29860 out of the $50,000 that he was charging me to represent my son. Gregory Cummings never disclosed any of the information that he’d promised to disclose—the two victims’ autopsy reports, my son’s cell phone records and a single sworn deposition from the one and only witness that placed my son at the crime scene (Trentin Ross). Over the sixteen months that Gregory Cummings was collecting my money—he refused to allow me to hire a private investigator. Gregory Cummings never prepared for anything as far as my son’s defense was concerned. When I filed a complaint with The Florida Bar outlining their rules that Gregory Cummings violated—their response was that he didn’t violate any of their rules. When DeShon filed a complaint with The Florida Bar—let’s just say that he hasn’t heard back from them and it’s been over six months. Note: Gregory Cummings did not deliver at all! And when my son told him that I wanted him fired—Gregory Cummings (who by the way is also registered with the Office of Criminal Conflict and Civil Regional Counsel (Region One) as a Conflict-free Attorney)—he told my son that he’d continue on his case for free of charge—my son politely told him, no. So where Gregory Cummings knew that he’d done wrong by my son and me—The Florida Bar didn’t acknowledge Mr. Cummings wrong doings. My son’s case defaulted back to the Public Defender’s Office and eventually settled back in the Office of Criminal Conflict and Civil Regional Counsel’s Office. Nothing about my son’s judicial process makes sense. There were no depositions of Leon County Sheriff Deputies (which was probably to keep them from Perjuring themselves—which didn’t work because compared to what was in their official reports within the Discovery Report they still Perjured themselves). A civilian witness and four or five deputies did not appear in court to answer to their subpoenas for the Evidentiary Hearing held by Regional Counsel Daren Shippy—yet, Judge Fulford delivered rulings mostly denying Regional Counsel Daren Shippy’s motions. The autopsies of the victims were never disclosed—never made public record. Dr. Anthony J. Clark with the District Two Medical Examiner’s Office who performed the autopsies on both victims was called to the stand as State Prosecutor Jack Campbell’s witness. Dr. Anthony J. Clark sat on the witness stand very proudly as he informed the court of his education (M.I.T graduate, etc.) and what qualifies him to be an expert witness. Dr. Clark went further to give the members of the jury and everyone in the courtroom an in depth insight on the study of Rigor Mortis and Livor Mortis. While Dr. Clark acknowledged that he did not go to the crime scene, he stated that he first came in contact with the bodies the following day. Also, acknowledging that he used the photos of the crime scene to help with the determination of his findings at autopsy. Dr. Clark basically told everyone—there are three stages of Rigor Mortis: the first 12 hours which Rigor Mortis forms; going into the second 12hours which Rigor Mortis stays firm and going into the third 12 hours which Rigor Mortis starts to breakdown. Next, Dr. Clark tells everyone about the process of Livor Mortis. According to Dr. Clark, Livor Mortis goes through a process of about 8 to 12 hours. If you know anything about Jell-O then you know that you cannot rush Jell-O to get firm. Once Jell-O is mixed in hot and cold water (liquid form), if Jell-O was to be put in the freezer—it will freeze. If you put it in the refrigerator and then take it out of the refrigerator too soon—it will be mushy. Jell-O must go through its normal process in order to gel/mold/get firm. Just like the stages of Rigor Mortis and Livor Mortis—they must go through their processes in order to be determined/to note their stages/levels. The Leon County Sheriff’s Office and the State Attorney’s Office concluded long ago that my son murdered the victims in their townhouse on January 27, 2011 at 4:14 a.m. The victims were found murdered by their mother on January 27, 2011 at about 10:15 a.m. that’s a six (6) hour timeframe. That is Not enough time for Rigor Mortis to be firm—That is Not enough time for Livor Mortis to be “fixed.” Note: The scientific definition for fixed is firmly in position; stationary. (2) Determined; established; set. (3) Not subject to change or variation; constant. Leon County Sheriff Deputies reported that the last cell phone activity from the female victim’s cell phone was on January 26, 2011 at 10:59 p.m. The victims’ mother reported that she took her daughter and toddler granddaughter to the townhouse on January 26, 2011 around 10 p.m. and left about 10:30 p.m. at which time she says that she never saw her son. Former Deputy Clifton Couch took the statement of a neighbor who said that she saw the male victim allow a male—who seemed to be acting suspicious—into the townhouse between 9 p.m. and 10 p.m. the night of January 26, 2011. If one were to count backwards—whether it be from the last cell phone activity from the female victim’s cell phone or the neighbors account of when she saw the male victim allow a suspicious acting male into the townhouse—both victims stage of Livor Mortis fits perfectly into that 8 to 12 hour timeframe. The female victim’s stage of Rigor Mortis was noted as slight to moderate—possibly because she was obese and pregnant (which may slow down Rigor Mortis). However, the male victim, who was basically noted as being physically fit—his stage of Rigor Mortis—firm/stiffness fits perfectly into going into that second stage of Rigor Mortis as described by Dr. Clark. On the evening of January 26, 2011 DeShon was 19 miles away at Taco Bell working. DeShon ended his 7 ½ hour shift on the morning of January 27, 2011 at 1:30 a.m. DeShon did not take a dinner break—he worked straight through his shift—he did not have access to a car. Note: The level of ignorance that these people of authority have displayed in order to have my son convicted of Two Murders and Solicitation to Commit Murder is very sad. So far about fourteen complaints have been filed against them with respective agencies stemming from my son’s trial. As part of State Prosecutor Jack Campbell’s attacks on defense witnesses—he loves to use the relationship between the witness and the defendant as to why the witness is giving favorable testimony for the defense. So now, think about it—State Prosecutor Jack Campbell being the son of Leon County Sheriff Larry Campbell—who has jurisdiction over the murder investigation—is fully aware of the power and influence relationships have in the courtroom. That is why I begged for a Special Prosecutor to be assigned to my son’s case—it didn’t happen. I can almost guarantee you that if the jury was aware that State Prosecutor Jack Campbell was the son of Leon County Sheriff Larry Campbell before litigating a case where the Leon County Sheriff’s Office has jurisdiction over the investigation—where the majority of “expert” witnesses are Leon County Sheriff’s Criminal Analyst—the jury would be at a lost as to what to believe. Without a competent legal defense representation—the jury wouldn’t have much of a choice but to return guilty verdicts (such as in my son’s case). Leon County Sheriff Larry Campbell and State Attorney Willie Meggs are allowing State Prosecutor Jack Campbell to play Tallahassee citizens for fools! My son was 17-years-old when he was arrested. Was he a rebellious son? Yes. Did he have a non-violent Juvenile Record? Yes. Did he have a violent Juvenile Record? No. Was he a documented Gang member? No! Did my son show interest in gangs? Yes. But that’s no different than men who work in Corporate America—who go out to get their fake tattoos and tie on their colorful bandanas—hop on their motorcycles— and ride over to Daytona Beach for Bike Week. Or those men who work in Corporate America that pull their Harley Davidson motorcycles on motorcycles trailers for a week at a Sturgis Rally—when all the real bikers ride their motorcycles the entire distance to get to the rally. Prior to arresting my son, Leon County Sheriff’s Deputies interviewed several people who knew my son—nobody said that my son was a gang member—because he was not—he did not fit the profile of a gang member. My son, who is now 20-years-old, took the stand and testified to answer whatever questions State Prosecutor Jack Campbell had to ask. Although my son cried at times during his testimony (as he’d done days earlier—he held his head down when the video of the crime scene was being viewed—my son—with tears in his eyes—my son was more man than State Prosecutor Jack Campbell and Regional Counsel Daren Shippy combined. My son did not LIE about his Innocence! My son is scheduled to be sentenced to possibly two Life Sentences on December 16, 2013. The evidence shows his innocence—the Perjured testimony of witnesses is what got him convicted. I wrote my son and told him that I will not be at his sentencing. Leon County Sheriff Larry Campbell and his son, State Prosecutor Jack Campbell has worked together to keep my son in solitary confinement and has not allowed him to have visitors or make phone calls for over a year. They have lied and said that I was to have played a role in the Solicitation to Commit Murder plot—which turned out to actually be a scheme that State Prosecutor Jack Campbell headed up—another LIE that went unaddressed by Regional Counsel Daren Shippy. I must say, Governor Scott—the one thing that you, my son and I definitely have in common—is that we put our trust in people to do their jobs and they severely failed us. While they made a fool out of you—they clowned my son and I. Now when I say that they made a fool out of you—I say that respectfully. Governor Scott, everybody is fully aware that you’ve actually looked a man in the face who was a victim of Florida’s Judicial System. You, sir, looked a man in the face who’d been locked up in prison for 27 years for a crime that he did not commit. Grant it—27 years ago, you probably wasn’t thinking about being the Governor of Florida—but you had to apologize for the injustice that Florida’s Judicial System handed down to Mr. William Dillon 27 years ago. You had to apologize to Mr. Dillon for his wrongful conviction—for in part, what authorities blamed on “witness misidentification” as being the reason for his wrongful conviction. It’s extremely unfortunate that those who hold positions to represent the integrity of the State of Florida—would force a wrongful conviction to happen to a 17-year-old Black kid under your watch. It doesn’t matter that my son is 20-years-old now—he was 17-years-old when he was arrested. In my son’s case—the misconduct and Perjury is that of Leon County Sheriff’s deputies, lawyers, judges, and the medical examiner—the two civilian key witnesses are just following their leaders. There is a different key witness in each of my son’s cases—one for the two murders and another one for the solicitation to commit murder. Each of the witnesses has pending charges against them. Each of the witnesses basically testified that they’re looking to get relief on their charges for their testimony against my son (In the solicitation to commit murder—State Prosecutor Jack Campbell recruited this 28-year-old man who’d been previously convicted of felonies to befriend my son. Note: Leon County Sheriff deputies had long put in their report that my son was a documented gang member. Even when my son told them that he wasn’t a gang member. This man claimed to be a Gang member and was in jail for Armed Bank Robbery (the state prosecutor on his case had filed a Notice of Prisoner Releasee Re-offender Act) therefore, this man was desperate for relief. Within an hour of confirming that he’d help State Prosecutor Jack Campbell and State Attorney Investigator Jason Newlin do whatever needed to be done to set up my son for solicitation to commit the murder of the key witness on the double murder case (Trentin Ross), this 28-year-old man was free from jail. Prior to getting out of jail—this 28-year-old man taught my son how to read and write in Gang Code. Once he got out of jail—he taught Inv. Newlin and Deputy Ronald O’Brien how to read and write in Gang Code. Together they wrote Gang Coded letters and Deputy O’Brien smuggled the letters into the jail—placing them in with the other inmates’ mail. The 28-year-old man was given money by Deputy Ronald O’Brien—in part to buy a cell phone and set it up for my son to be able to call him—and in part to put money on my son’s canteen—this was an attempt to get my son to trust him—in which my son refused to accept money from him. The recorded phone conversations reveal the desperation of the 28-year-old man—who seems to have his mind set on murdering the witness in my son’s case—even when my son changes the subject—this man always reverts back to his own plan. Note: Another inmate testified on my son’s behalf and basically stated that this particular inmate seemed obsessed with wanting to murder the witness against my son. That obsession can be heard in the jailhouse recordings. My son never asked him to murder anyone. My son never hinted to him to murder anyone. The 28-year-old man—while out of jail working for State Prosecutor Jack Campbell may have proved to be the worst of the worst. The 28-year-old man committed Armed Home Invasion Robbery, Kidnapping, Assault and other charges in both Gadsden and Leon County—he is now facing 55 years or more in prison. With those additional charges—there’s no doubt that he will provide State Prosecutor Jack Campbell with any testimony that he wants—as long as he can get time off of his sentence for his testimony. Where State Prosecutor Jack Campbell set out to continue to make my son look like a monster—if all of the evidence were to be brought to the table, everyone would see who the real monster is. The key witness in the murder case and his attorney Paul Srygley—both testified that they were holding out for the best deal on Mr. Ross’ pending cases. Mr. Ross is charged with Cultivation of Marijuana and Possession of Drug Paraphernalia. For nearly two years—Mr. Ross and his attorney have refused to answer to a Subpoena for Deposition. Neither of the key witnesses in this case gave depositions. Regional Counsel Daren Shippy had the Red Carpet rolled out for impeachment of both key witnesses as well as other witnesses—but impeaching witnesses wouldn’t have gotten State Prosecutor Jack Campbell the guilty verdicts that he so desperately needed. History tells us that a lot of people lost their lives in order to ensure us that no local or State court will have all the judicial power—mainly because of gross biasness that has plagued my son’s case. When justice on the local and State level fail us—we can turn to our Federal Government to depend upon for justice. Gideon’s Promise (formerly known as The Southern Public Defender Training Center) is on a trailblazing mission to inspire, mobilize and train legal professionals to provide the highest quality defense representation to people unable to afford an attorney. Gideon’s Promise was recently awarded $6.7 million by U.S. Attorney General Eric Holder to improve legal defense services for the poor. Although Gideon’s Promise does not have a partnership with Florida’s Law Schools or the Public Defender’s Office—no amount of U.S. Attorney General Eric Holder’s $6.7 million can prepare any Public Defenders, Regional Counsels or Conflict-Free Attorneys to train/strategize against gross bias actions in the courtroom between State Prosecutors and Judges—where the Judge rules in favor of the State Prosecutor 9 out of 10 times. Governor Scott, at this point, I ask of you to do whatever you can to help my son. I also ask of you to do whatever you can do to prevent any other family from ever having to experience this battle against father and son. State Prosecutor Jack Campbell and his dad, Sheriff Larry Campbell may have the physical advantage over DeShon and I— but DeShon and I have the Spiritual advantage in this battle and we will Win. But everybody might not have Favor with God—so this battle is not just unfair for the defendant—but also, for Leon County Sheriff’s Deputies as well. None of the Leon County Sheriff’s Deputies should be subjected to having to be evaluated by their boss’ son while under oath. In my son’s case, after certain deputies finished giving his testimony—there was an obvious look of concern on their faces. Deputies should be able to step off of the witness stand feeling good about their testimony —not carrying the burden of wondering if their testimony was satisfactory to State Prosecutor Jack Campbell’s standards—and if not—what is he going to tell his dad about them. How intimidating is that? Also, I would ask that a study be conducted to see just how many private paid attorneys are paid thousands and thousands of dollars by their clients and then get fired for failing to provide effective representation—only to have the client default (back) to the Public Defender’s Office—then, of course, have their case possibly get farmed out to the Office of Criminal Conflict and Civil Regional Counsel or a Conflict-Free Attorney (seeing as though the Public Defender’s Office is so overwhelmed with cases). If private attorneys are not held accountable by The Florida Bar (such as Gregory Cummings), then what’s to prevent them from allowing their cases to regularly default to the Public Defender’s Office after they’ve collected a lump sum of money from their clients? I guess you can say that my point is The Florida Bar failed my son. The Florida Bar failed Public Defense Attorneys. The Florida Bar just may be the source as to why Public Defense Attorneys are overwhelmed with cases. The Florida Bar failing to hold Defense Attorney Gregory Cummings accountable for collecting thousands of dollars more than what Public Defense Attorneys are paid (on just one private case) and not doing the work to off-set his profit—is not just my family’s issue. When my son’s case defaulted back to the Public Defender’s Office—it became Florida taxpayers’ issue. Every time my son’s case was sent to a new attorney—the clock on his case started all over again. My son’s case started all over again five times—in two and a half years. Lastly, I have decided to share this letter with others whom I feel may be able to make a difference with making the judicial process in Leon County better. Because with all of this happening on my son’s case—imagine how many cases are out there that have not been brought to your attention. Also, one of the main issues that attorneys that I contacted in Jacksonville, Orlando and Miami brought to my attention was that they could not access information about my son’s case online—on the Leon County Clerk of Courts website—the attorneys could only access Traffic and Misdemeanor cases. And what they could access online very little information. This was a huge issue with me hiring an out of town attorney—I just could not afford to pay for every attorney to travel to Tallahassee in order to obtain the basic information about my son’s case (Public Records Requests are 30 days). My son was truly “Boxed in” to only being represented by attorneys in Tallahassee (whether private or public). So as elected officials, as appointed officials, as board members, as committee members, as directors, or as chairpersons—whatever capacity that they may have in government—their knowledge of these issues that I’ve raised in this letter affords them to exercise due diligence to strengthening Florida’s Judicial Process and protect taxpayers dollars. Via Email: Senate Criminal and Civil Justice Appropriation Committee: Senator Rob Bradley, Senator Arthenia Joyner, Senator Alan Hays, Senator Thad Altman, Senator Oscar Braynon II, Senator Jeff Clemens, Senator Charles “Charlie” Dean Sr., Senator Miguel Diaz de la Portilla, Senator Anitere Flores, Senator Rene Garcia, Senator Denise Grimsley, Senator Christopher L. Smith, Senator Darren Soto/ Criminal Justice Committee: Senator Greg Evers, Senator Audre Gibson, Senator David Simmons and some of those named above who are joint committee members.